Last week I attended the Family Online Safety Institute's (FOSI) outstanding 2nd annual conference and was pleased to host two sessions during the day-long event. The event brought together the best and the brightest in the field of online safety issues for an in-depth discussion of the issues and policies surrounding how to better protect our kids online while still preserving our First Amendment rights and the vibrancy of the Internet. It was also my great honor to be one of the recipients of "The Family Online Safety Institute Award for Outstanding Achievement," which is, "is awarded to those individuals who have demonstrated an outstanding commitment to advancing the goal of a safer Internet." I was one of eight people involved in the ceremony, and they all deserved it much more than me! 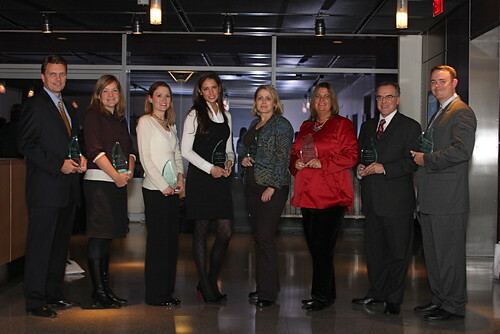 [Picture of awardees below and more info about each of them here.] And you can find out much more information about the event, panels, and keynote speeches here. It was a great conference thanks to the tireless efforts of my friend Stephen Balkam, CEO of FOSI, and his outstanding staff.